I should not be reading at the moment. I hardly have time to draw breath, the days are a manic race through a to-do list which would make a great scarf if I could wear it. Crazy as it sounds, at night, when I crash onto my bed past bedtime, I fire up the e-reader. Sometimes turning it off past midnight. I need some ‘me-time’, a dose of self indulgence. 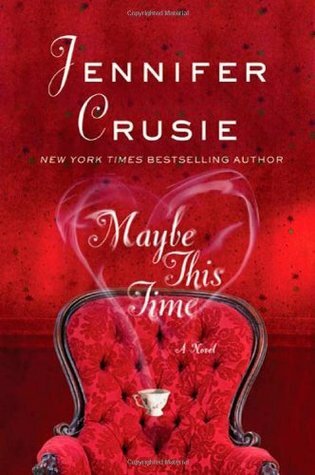 Yesterday I finished reading ‘Maybe This Time’ by Jennifer Crusie, it was the first book which I have read by her and it won’t be the last. The romance in ‘Maybe This Time’ is predictable, except that the couple don’t have a relationship crisis 3/4 way through the book. By page 3 you know who will get together and do the happily ever after number. The unusual haunted house setting, set it apart, and worked really well. I like Jennifer Crusie’s writing style and enjoyed the characters who she created. I have never recommended a Chic Lit book to my husband, but I think that Cliff will enjoy this one. A few Jennifer Crusie fans have told me that this is not her best work. If that’s the case then I have a lot to look forward to in future reading. I love discovering a ‘new’ author and have already downloaded a few more of her books. Now until I make a dent in the dread to-do list, get some serious sleep and get rid of the twitch in my eyelid, I had better not turn my e-reader back on.